The DJIA is just slightly up today, breaching the 11k mark. European leaders agreed over the weekend to "make available" $40.5billion loans ($12ish from Germany alone) if Greece asks for it. 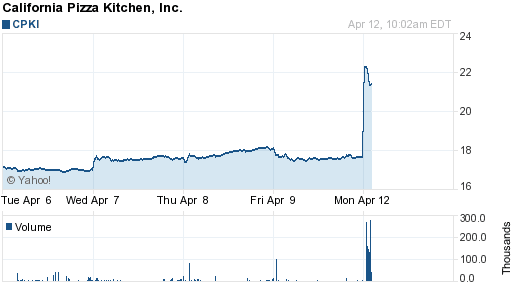 California Pizza Kitchen (CPKI) formally announced that it is indeed seeking a buyer. If no is interested, they'll buy back a few shares and call it a move to "increase shareholder value." 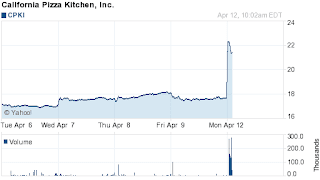 LOS ANGELES--(BUSINESS WIRE)--California Pizza Kitchen, Inc. (Nasdaq:CPKI - News) announced today that its Board of Directors has authorized management to consider a wide range of financial and strategic alternatives to enhance shareholder value. The Company has engaged Moelis & Company, a global investment bank, to be its exclusive financial advisor in this review. Financial and strategic alternatives may include, but are not limited to, changes in the Company's capital structure, or a possible sale, merger or other business combination. Dean Goodermote, Double-Take’s Chairman and CEO noted that “the quarter finished weaker than we expected. Software license sales were up over last year, but they did not rebound to the extent that we anticipated. Renewal rates were strong, pipelines are good and controlled spending kept our margins at or near the low end of our guidance. We plan to reduce our hiring expansion plans until we experience growth at a faster rate. In addition, although we are evaluating expressions of interest in the Company, we continue to plan for a strong independent future,” concluded Goodermote.